1158 New Saar - 1947 / 59, very nice mint never hinged collection, complete with all issued stamps on lighthouse hingeless preprinted pages. 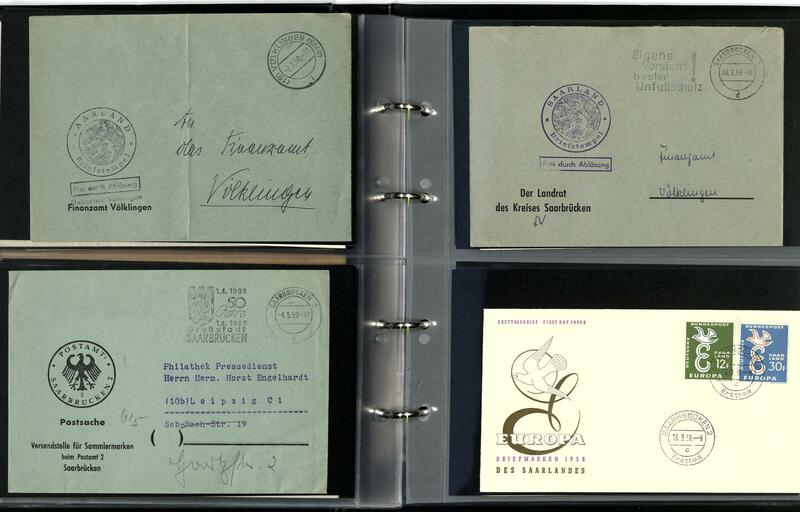 Also the scarce initial printing set complete in perfect mint never hinged condition without any signs with photo certificate \"the quality is perfect\" Geigle BPP, furthermore naturally also the flood souvenir sheet pair, all welfare sets, Council of Europe, Day of the Postage Stamp, official stamps set and so on. A very nice quality object! 1205 ⊙ 70/83, 84/97 Saar - 1920 / 34, superb used collection on lighthouse hingeless preprinted pages with sought-after issues, better values and sets, as well overprint items, two landscape sets (Michel no. 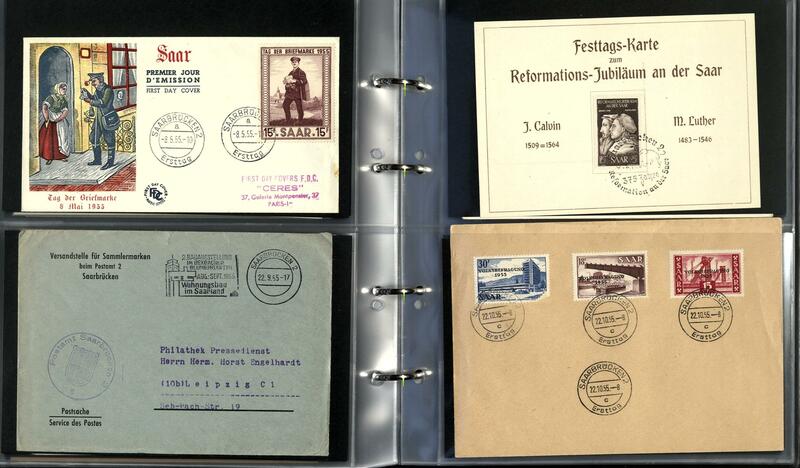 70 / 83, 84 / 97), peoples help 1926 / 27, 40 C. 3 Fr. Peoples help 1928, 5 Fr. 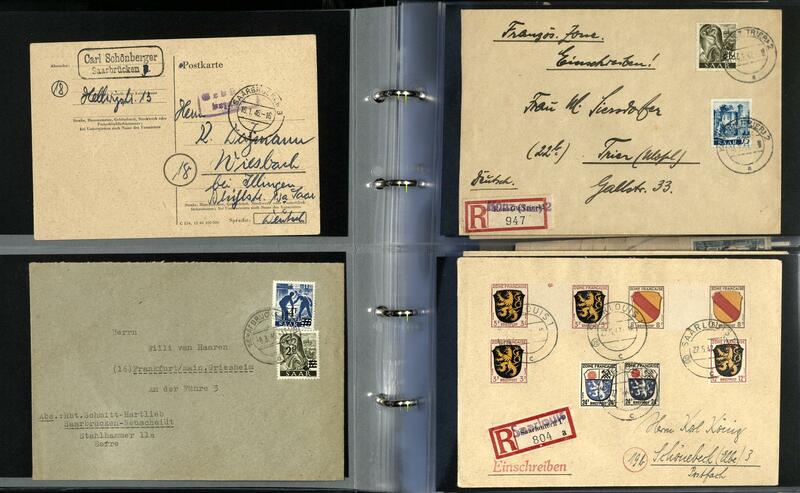 Airmail, Neunkirchen set 1933 neat cancelled expertized Ney BPP, referendum postage stamps set and airmail issue and so on. Favorable valued! 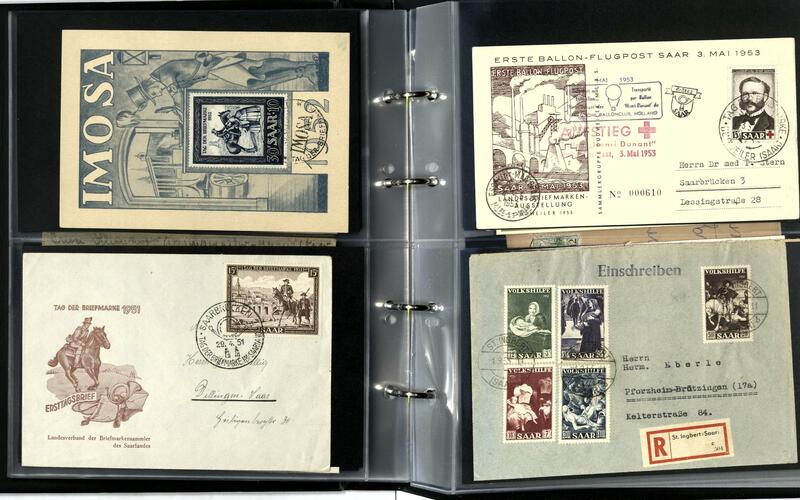 1216 ⊙ New Saar - 1947 / 59, nice used collection, complete formed in the Schaubek hingeless illustrated album, stamp without guarantee. 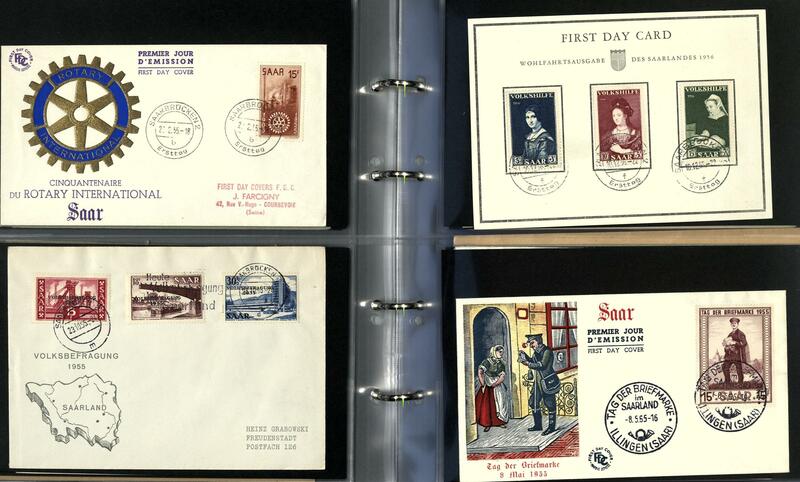 Also the scarce initial printing set, flood souvenir sheet pair, all welfare sets, Council of Europe, Day of the Postage Stamp, official stamps set and so on. A superb collection! Michel for genuine used approximate 38000,- €. 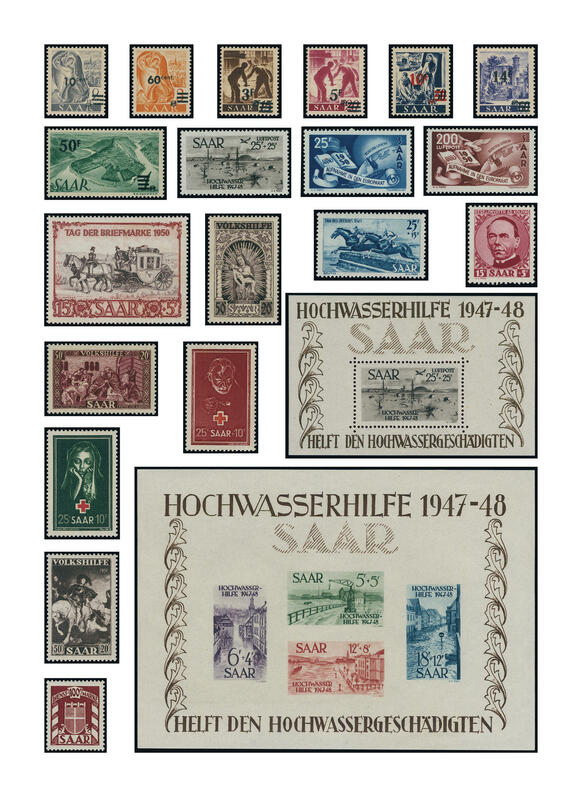 1450 /⊙ 252/54 New Saar - 1947 / 59, nice collection in the Sieger album with mounts with numerous different issues, including complete sets and so on. With also Michel no. 252 / 54, 293 / 95, 313, 380 / 99, 409 / 28 and so on. Favorable! 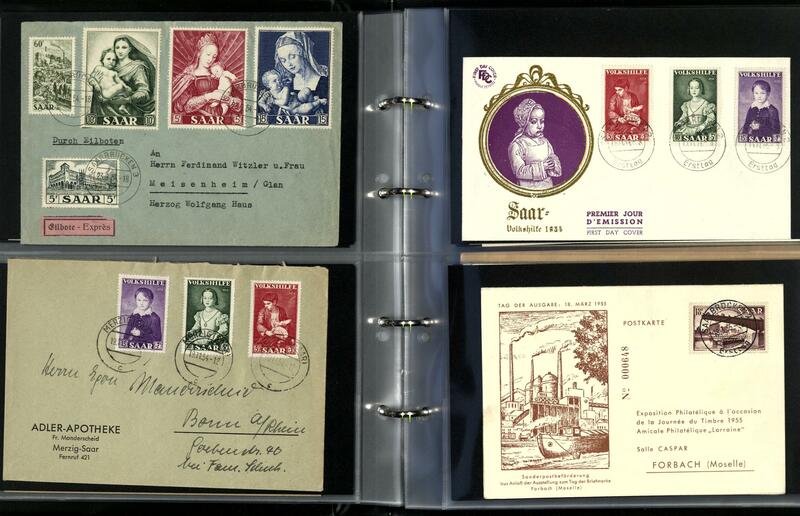 1460 New Saar - 1957 / 59, clean mint never hinged collection, in the number of a major listing complete with all issued stamps in the hingeless illustrated album including flood souvenir sheet pair, all welfare sets, Council of Europe, Day of the Postage Stamp, postal stamps, official stamps set and so on. A very nice object! 1677 New Saar - 1947 / 59, nice mint never hinged collection, except for the flood souvenir sheet pair in the number of a major listing complete. With also all welfare sets, flood set, postal stamps, Day of the Postage Stamp, Council of Europe, official stamps set and so on. Favorable! 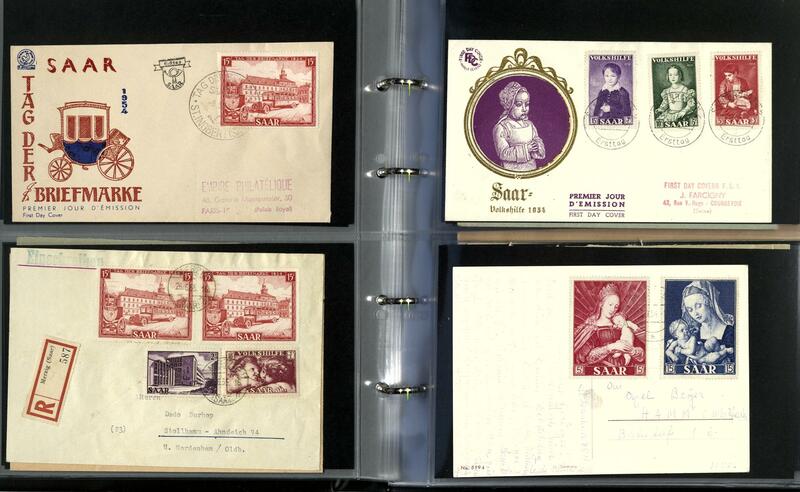 1741 New Saar - clean mint never hinged collection on stock pages, with also airmail 1948, flood set, peoples help 1949 / 51, day of the horse 1949, Day of the Postage Stamp 1950, Red Cross 1950 / 51 and so on. Favorable! 1807 x Saar - extensive inventory packed in a carton with lots of material in glassine-bags, on stock cards and so on, as well issues from former and New Saar, a plethora of complete sets, much mint never hinged material, blocks of four, sheet and parts of sheets, some Heuss sets and so on. Favorable treasure trove! 1895 /⊙/ New Saar - 1947 / 59, rich collection in the lighthouse hingeless illustrated album. As well better issues as for instance also 25 Fr. 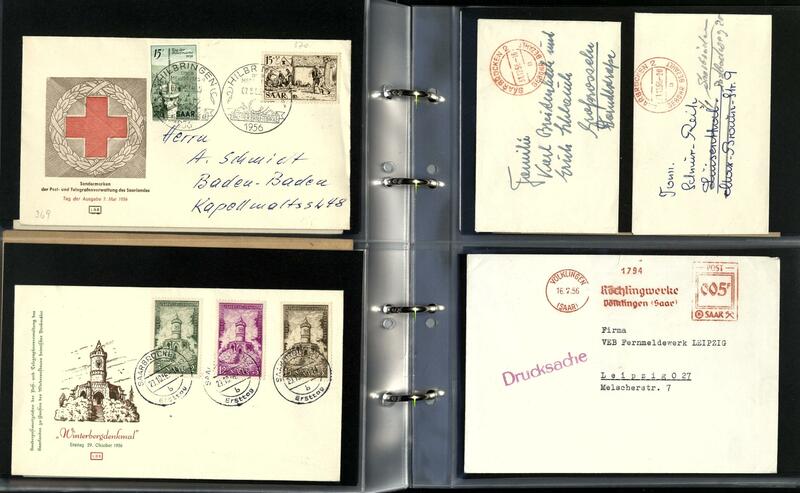 Flood in the gutter pair mint never hinged, peoples help 1949 / 51, Day of the Postage Stamp 1950, as well numerous further issues, both Heuss sets and so on. Favorable! 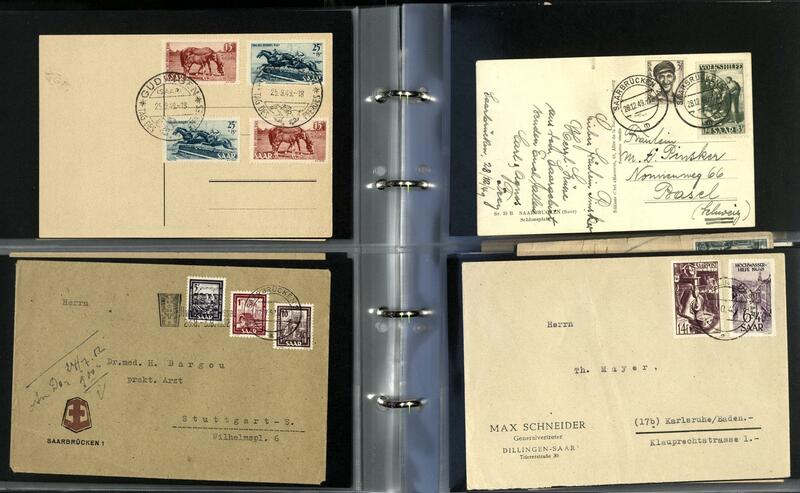 1904 /⊙/ New Saar - 1947 / 59, rich collection on Schaubek preprinted pages with useful issues including flood set, day of the horse 1949 used, Day of the Postage Stamp 1950, Red Cross 1950 / 51, peoples help 1951, both Heuss sets and numerous further issues. Favorable! 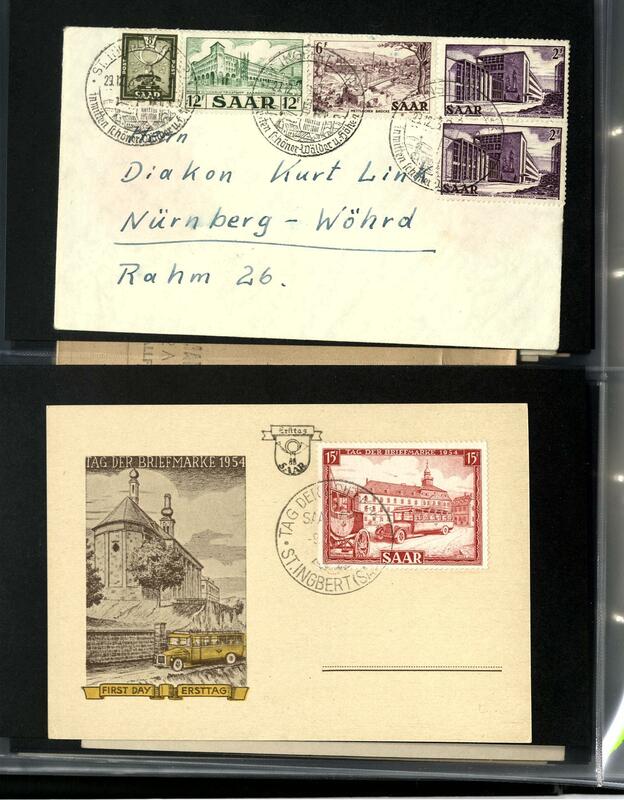 1910 /⊙/ Saar - 1920 / 34, interesting collection the old Saar issues on Schaubek preprinted pages. 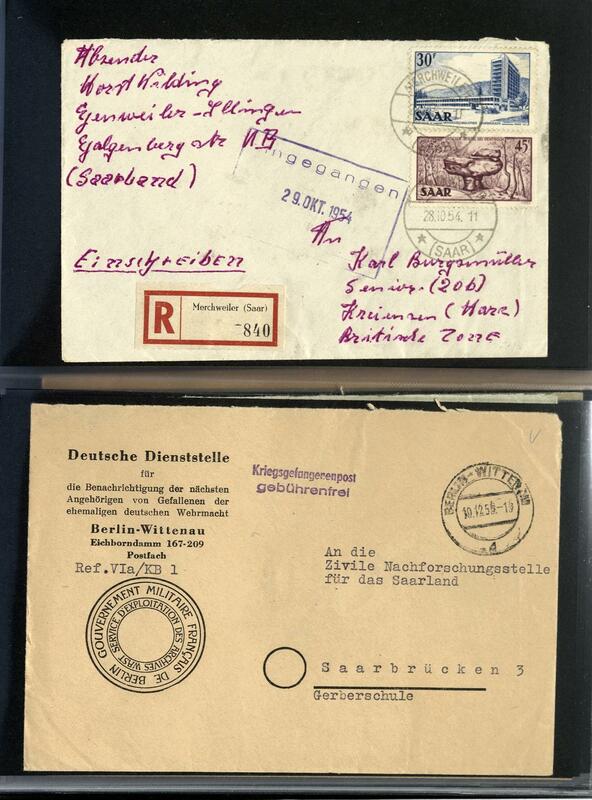 As well various overprint items Sarre-Germania and Bavaria Sarre partly expertized Burger BPP, the two of them first landscape sets 1921, referendum airmail set mint never hinged, referendum postage stamps set, official stamps and so on. Favorable! 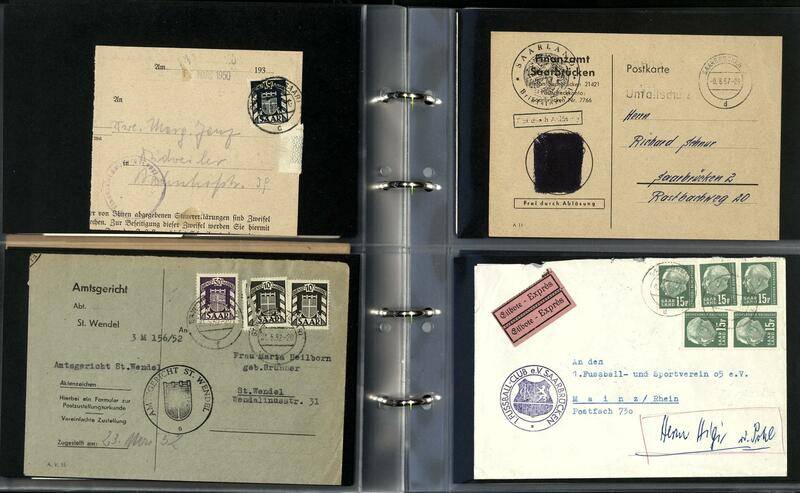 1915 ✉ New Saar - magnificent inventory from approximate 300 covers, cards, partly addressed, partly unmailed, in five ring binder accommodated with frankings of the French zone and cancellations saarländischer places. As well are many small places with a gigantic number rare rural postal service additional cancellation also smallest communities. In this volume become documents of this kind never offered. Both to the construction one special collection, as also to the liquidation in the best way suited! 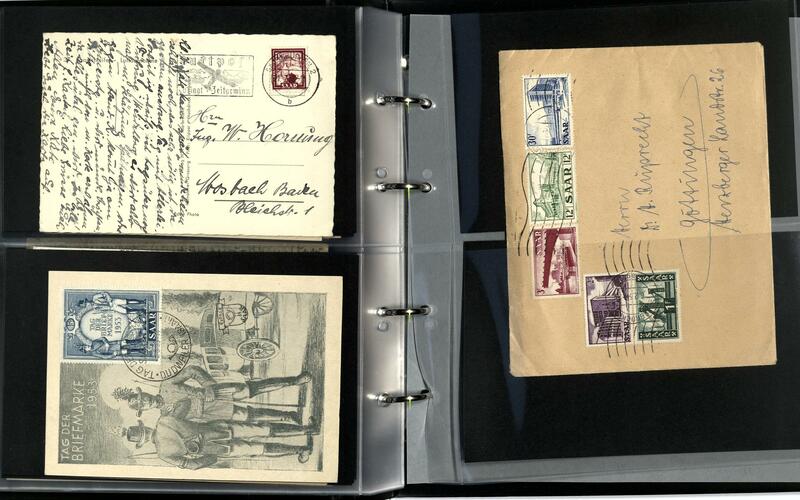 1923 ✉ New Saar - very interesting and rich collection from covers, cards and postal stationery in two ring binder accommodated with many better documents, sought-after frankings, different use form, postage steps, registered and so on. With also single- and multiple franking, registered, day of the horse 1949 twice on accordingly special card with special cancel, 12 Fr. 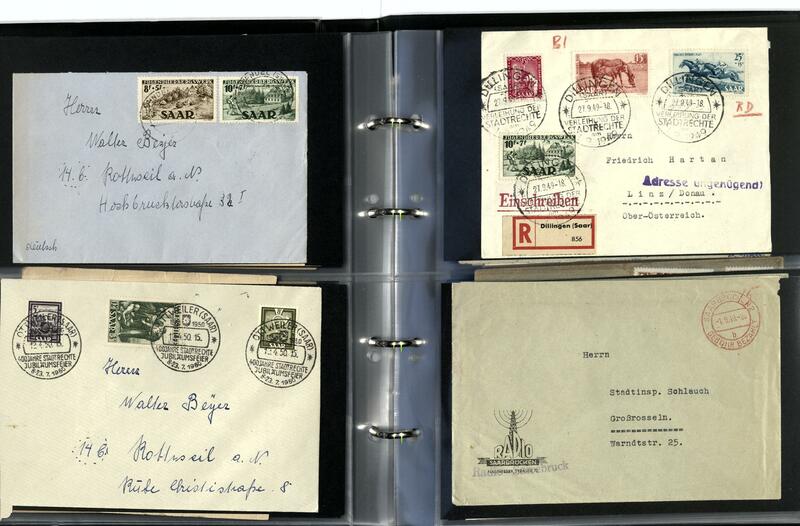 Peoples help 1949 with additional franking on correctly franked postcard to Switzerland, youth hostel association complete on cover, day of the horse 1949 with 10 Fr. 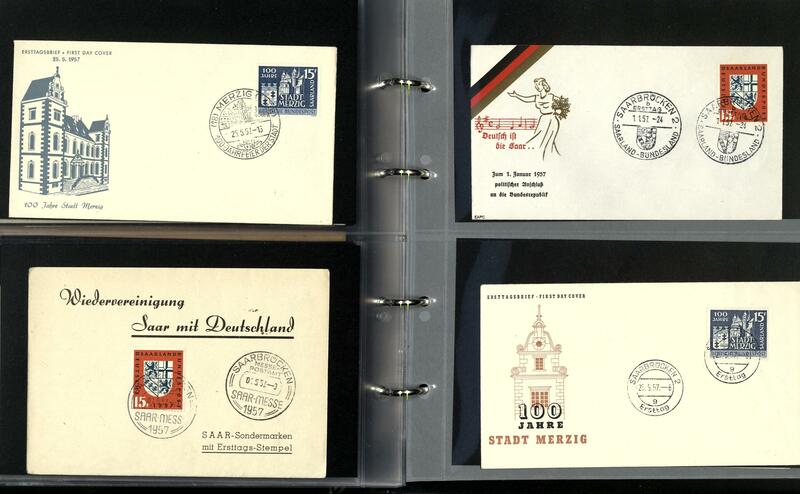 Youth hostel association and university on registered cover to Austria, Day of the Postage Stamp 1950 with additional franking on correctly franked cover, Kolping twice on covers correctly franked franked, peoples help 1951 as set franking on registered cover and numerous further nice documents. With also 15 Fr. Heuss 2. 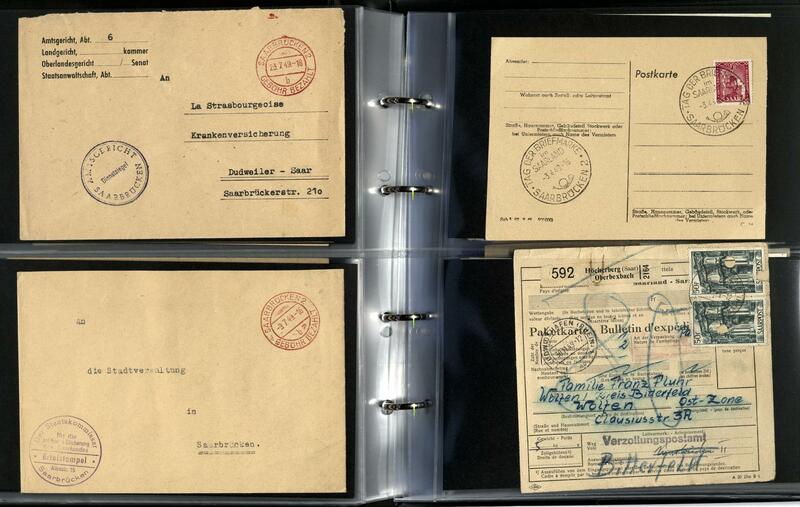 Issue five pieces as correctly franked multiple franking on commercially used special delivery letter to Mainz and so on. A magnificent object! 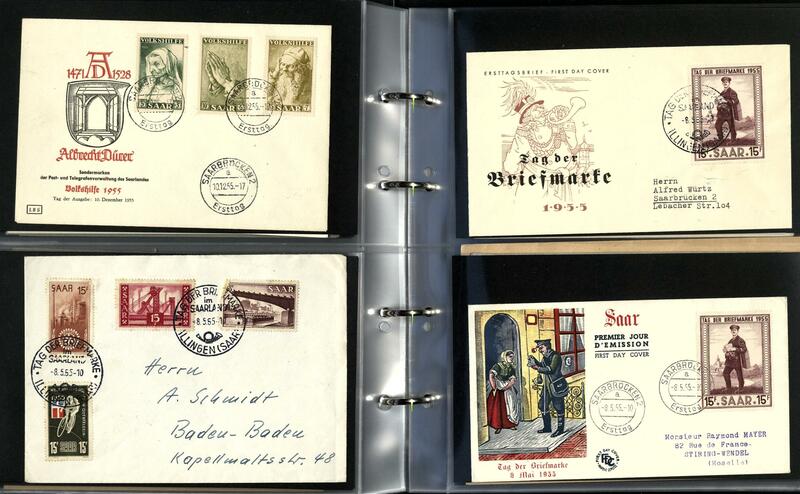 1937 ⊙ New Saar - 1947 / 59, extensive used collection on lighthouse pages with numerous different issues, complete sets, with also Day of the Postage Stamp 1950 expertized Ney BPP, Red Cross 1950 expertized Ney BPP, Council of Europe 1950 (200 Fr. ) a little higher signed Ney, both Heuss sets neat cancelled and once again complete on lovely illustrated First Day Cover and so on. Favorable! 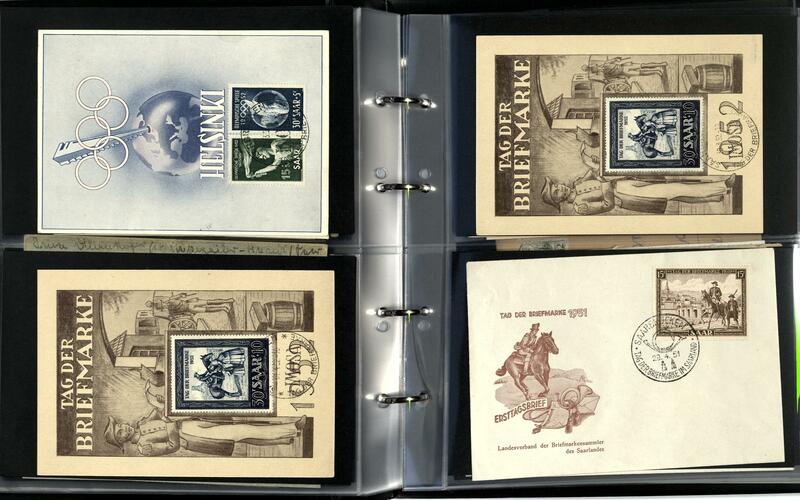 1976 x New Saar - interesting inventory packed in a carton with numerous issues mounted on pages, stock cards and so on. 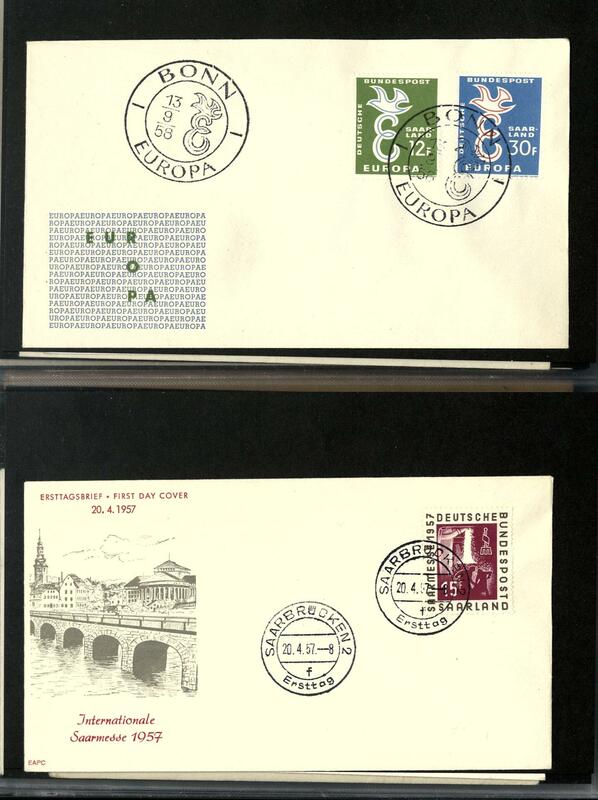 With also the small flood souvenir sheet, peoples help 1949 / 51, Council of Europe, Day of the Postage Stamp 1950, flood set and numerous further special- and commemorative issues and so on. Favorable treasure trove! 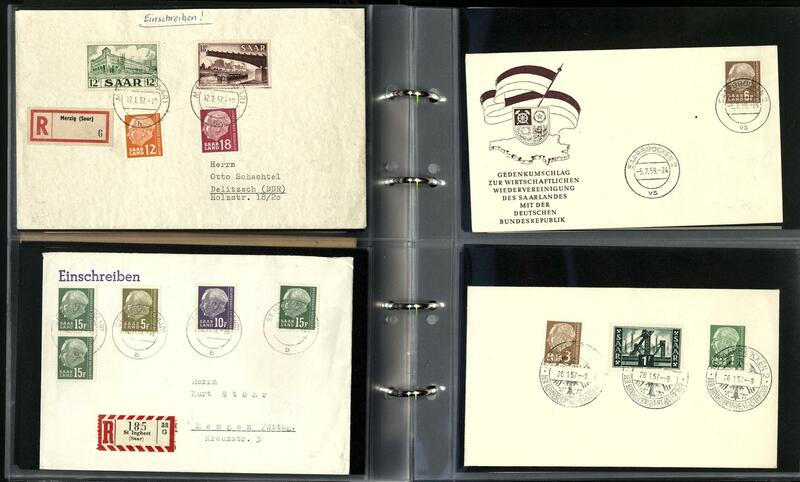 1994 ⊙ New Saar - extensive used collection with plenty of better issues including Council of Europe 1950, Day of the Postage Stamp 1950, peoples help 1950 / 51, official stamps 1949, both Heuss sets and so on. Favorable valued! 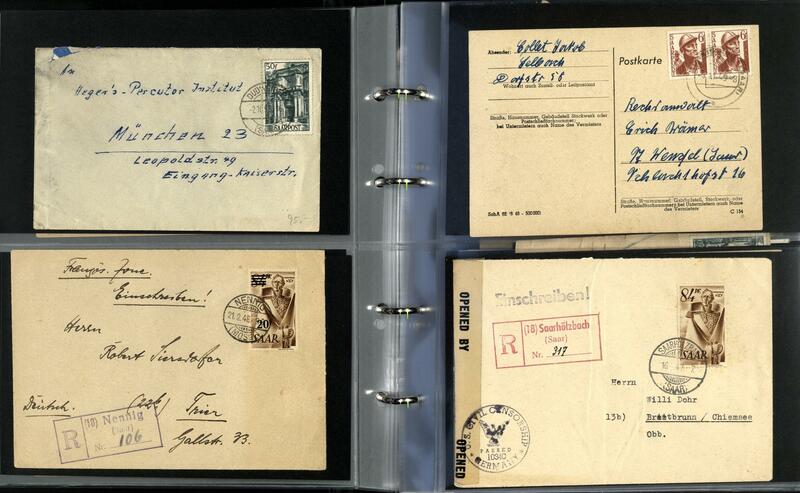 2114 239/51 New Saar - 1947 / 59, clean mint never hinged collection in two Lindner T hingeless printed form ring binder. With also Michel no. 239 / 51, 272 / 88, 293 / 95, 319 / 37, 338 / 40, 380 / 99, 409 / 28 and so on. Favorable! 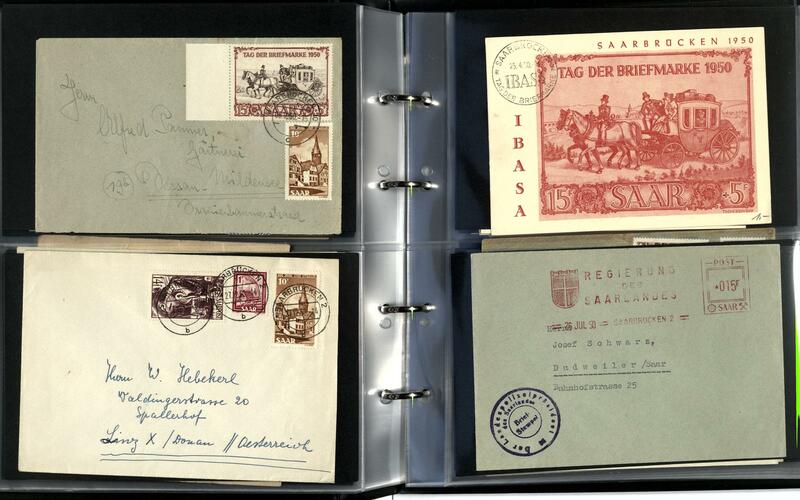 2116 ⊙ 319/37 New Saar - 1947 / 59, nice and extensive used collection on KABE preprinted pages with plenty of better issues including day of the horse 1949, peoples help 1949 / 51, Council of Europe, Day of the Postage Stamp 1950 from margin of sheet with special cancel, Red Cross 1950 / 51, stamps set, Michel no. 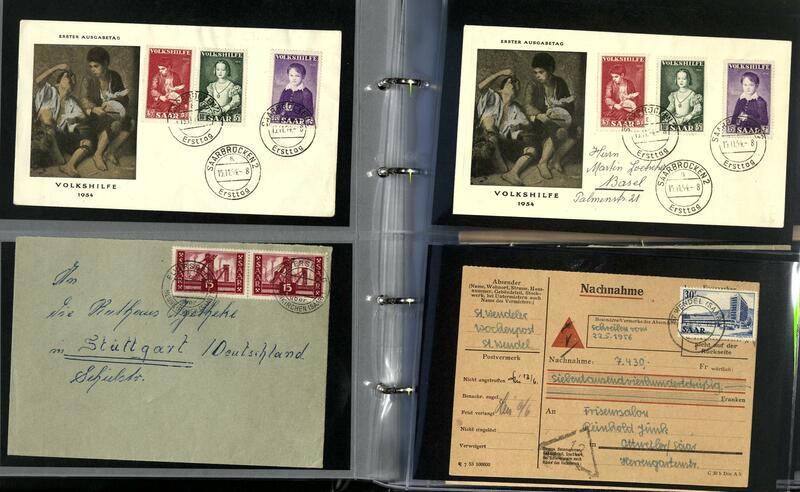 319 / 37, both Heuss sets, as well further better issues. A superb collection! 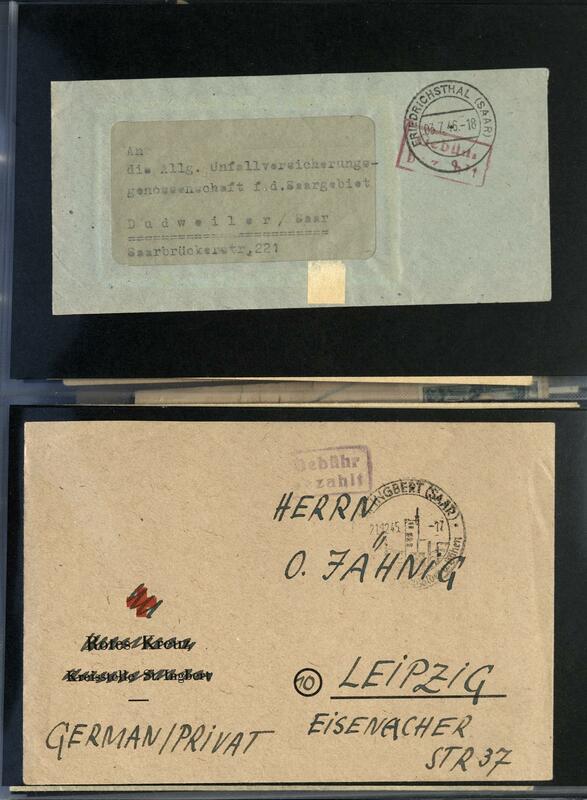 2123 /⊙/ Saar - extensive inventory housed in two large stockbooks with lots of material, often stacked closely one above the other, as well old Saar with numerous different issues, overprint value, landscape issues 1921 / 22, as well an extensive part New Saar including flood set, day of the horse 1949, Day of the Postage Stamp 1950, Red Cross 1950 / 51, peoples help 1950 twice, peoples help 1951 twice and much further material. Enormous catalog value! 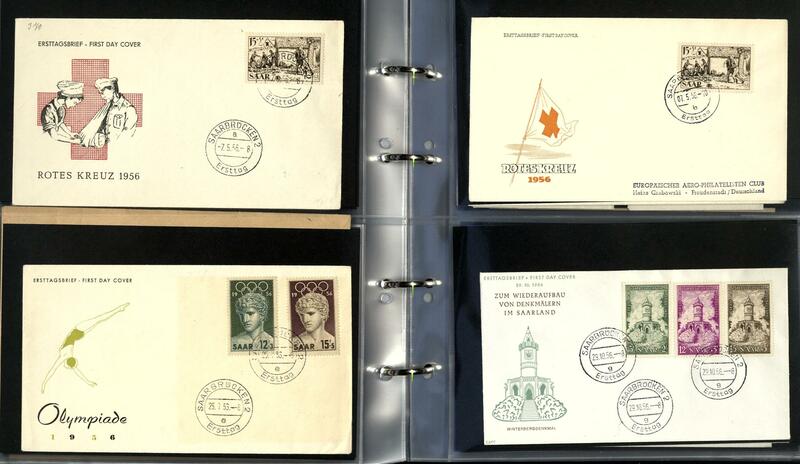 2180 / 171/77 Saar - 1920 / 34, nice collection in the spring back binder on lighthouse hingeless preprinted pages, many better issues including good mint never hinged sets. 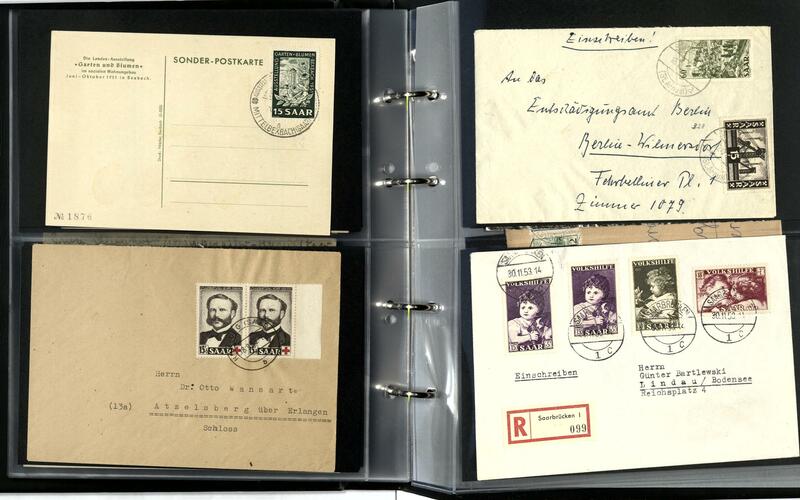 Included are also Sarre-Germania, all three landscape sets 1921 / 22 mostly mint never hinged including the supplementary values, peoples help 1929 mint never hinged, peoples help 1934 mint never hinged (Michel no. 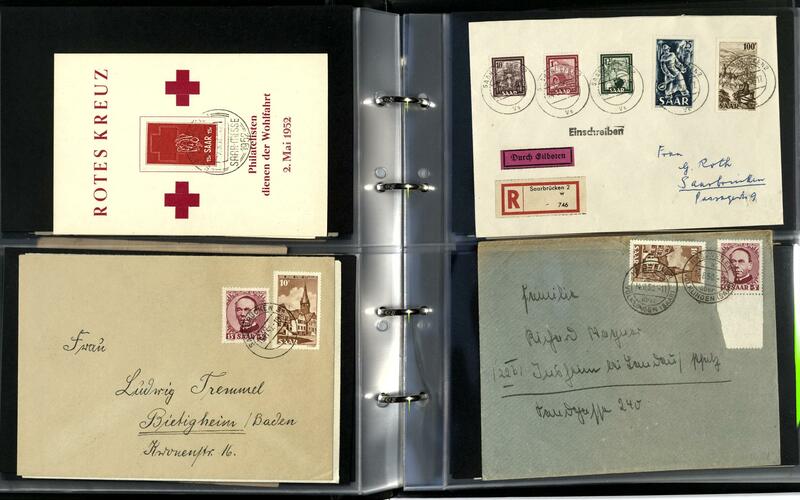 171 / 77), referendum postage stamps set mint never hinged and the accordingly airmail set mint never hinged and so on. A magnificent object!